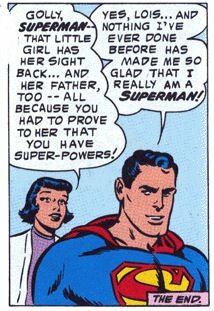 I just came across a 1955 Superman story called 'The Girl Who Didn't Believe in Superman'. I think I first read it in a British Superman Annual when I was a kid. I can't think why I, a devout Marvelite, allowed such a book into my bedroom. Re-reading it makes me wonder if there is after all a precedent for identifying the Last Son of Krypton with the Son of God. The Daily Planet is organizing it's annual 'Lovely Child' photo competition. The prize is a round-the-world sightseeing tour with Superman: but the winner of the competition, little Alice Norton, turns out to be blind. Not only that -- but she doesn't believe that there is any such person as Superman. The Man of Steel uses his super deus ex machina power to become an accomplished eye-surgeon and performs an operation which restores Alice's sight. She realizes that Superman is real after all, and he takes her on the promised world tour. Because of the publicity, Alice's long-lost father turns up: he's been in hiding because he blames himself for the road accident which blinded her. His wife reveals that he wasn't really to blame. Superman has not only restored her eyesight and her joie de vivre, but also Alice's family. This is a modern take on the old story about the blind men and the elephant. It amusingly shows how someone's beliefs about the world are determined by their point of view. It is also a classic Superman puzzle story. The young reader is supposed to be amused by the ingenuity of Alice's rationalizations, and to wrack his brain to think of a super-stunt that she can't explain away. (Much of the 1950s was spent pitting Superman against deliberately un-super opponents. "How can I convince a blind girl that I am Superman?" is really the same kind of question as "How can I trick Mr. Mxyzptlk into pronouncing his name backwards?") 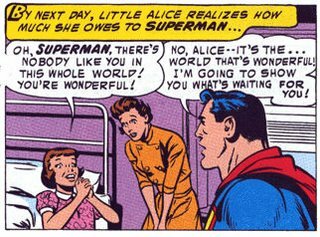 The resolution to the puzzle – that Superman's X-Ray vision accidentally reveals the cause of Alice's blindness – is actually a bit of a cop-out. But it takes the story off in a new and much more interesting direction. Alice's real problem is not her blindness: it's that she is caught up in a post-modernist paradox. She thinks that Superman is "a myth, make believe, a modern fairy tale." She tells the Man of Steel that "No man could have super-powers like that! Superman is just make believe...like the fairy tales Mommy tells me!" But from our point of view, that is precisely what Superman is: a modern fairy tale. The imaginary Superman-free world that Alice has created for herself is the same as ordinary world which we readers live in every day. Alice's mother say that "she retreats from reality more and more each day" – even though for us, it's believing in Superman, not doubting him, that would be considered a retreat from reality. Alan Moore's classic 1986 story "Whatever Happened to the Man of Tomorrow" began with the brilliant line "This is an Imaginary Story. Aren't they all?" I think that Bill Finger had made the same joke 30 years previously. Alice's physical blindness is a metaphor for her inability to perceive the innate goodness in the world. According to her mother "Because of her blindness, Alice has become a bitter, cynical child!" This cynicism is explicitly connected to her disbelief in Superman. "She must be drawn out of her shell! She must be made to believe in life again! If I can make Alice believe in me, she might begin to believe in the world around her...in the pleasure even a blind child can have! That's why it's so important that I convince her there is a Superman!" It's her skepticism, not her disability, which is the problem: if she believed in Superman then she could enjoy life – even if she remained blind. Having restored her sight, Superman flies Alice around the world. This is not depicted merely in terms of a person who has suffered a temporary loss of vision enjoying their restored faculties: we are supposed to imagine someone seeing the world for the first time – indeed, discovering for the first time what kind of world they live in. "This is your country" says Superman. "Golly! I never realized America was so big!" she replies. The word "wonder" is used four times in this sequence: Alice says that Superman is wonderful for having healed her; Superman says that it is the world itself that is wonderful. And Alice, who a few pages before was being cynical about fairy tales, suddenly decides that the whole world is like children's fantasy and she is a character in it. "It's just like you said it was...wonderful! Alice in wonderland, that's me!" Bet you didn't spot that line coming. The restoration of Alice's physical sight is a metaphor for the restoration of her "sense of wonder". What does the story 'mean'? In 1955, comics were written by adults and read by children. (Today, they are written by fanboys and read by no-one.) The comic may be playing with the idea that adults who lose their childlike enjoyment of fantasy also stop enjoying real life. It may simply be a warning to its readers not to lose their sense of wonder. It may even be telling them, very gently, that although they will one day grow up and realize that there is no Superman, the world is still very wonderful without him. At the beginning of the story, Alice's rejection of Superman is a rejection of the world itself. When she recovers her vision, she wants to give all her attention to Superman, but he points away from himself, and toward the world. In the penultimate frame, Alice has literally turned her back on Superman, because her attention is directed to her happy family. Superman slips away without saying goodbye, leaving Alice, in a very positive sense, back in a world without Superman. "Come on" he says to Lois "They don't need us any more." The Alice of the splash page ("there's no such person as Superman") and the Alice of the last page ("they don't need us anymore") could be seen as negative and positive metaphors for growing-up. But when I read a story about faith, which involves the healing of a blind person, I am inclined to ask whether the story is "really" about Jesus. In the Bible, Jesus heals several blind people; indeed, he begins his mission by announcing "freedom to the captives and recovery of sight to the blind." The New Testament healing stories are just that – stories about supernatural cures. But Christians also read them as metaphors about spiritual healing and forgiveness. "I once was lost, but now am found, was blind, but now I see." For a Christian, to come to believe in Jesus is to have your eyes opened; to see the world in a new way. Can this possibly have been in Bill Finger's mind when he depicted a little girl healing her life by believing in Superman? The scene in which Alice is healed is worth a close look. Superman can instantly memorize the contents of an entire medical library and uses his X-Ray vision and super-speed to perform an operation which no earthly surgeon could ever do. (This raises a question -- why doesn't he use his knowledge and power to heal all the other blind children in the world? – which some people have also wanted to ask about God.) The actual surgery isn't shown: all the drama is saved for the day when the patients bandages are removed. I don't know what post-operative dressings look like in a real hospital, but here, they look exactly like a blindfold: as powerful a way of illustrating "recovery of sight" as you could imagine. The whole sequence has a Biblical whiff. The captions drift into archaic language "Slowly, the binding cloth..." (why not just "bandage") "is unwound" (not "removed" or "taken off")"and light falls upon Alice's staring eyes!" Alice only gradually works out that what she is looking at is the Man of Steel. "Something...tall...it's getting clearer...why...it's a man wearing what I think must be a cape! I can see! I can see!" Bill Finger has temporarily forgotten that she was only blinded four years ago and knows perfectly well what a cape looks like. The metaphor about "seeing the world for the first time" has temporarily overridden the literal story about a child with a fragment of a windshield in her optic nerve. Does this recall the Biblical story of the blind man who said "I see men as trees, walking."? Many a preacher has pointed out that the first person that the blind man saw was Jesus: Alice's mother exclaims that the first person her daughter sees is Superman. In the next frame, Alice adopts what is distinctly an attitude of prayer to thank her saviour. Her words to Superman seem a bit prayer-like as well "Oh Superman! There's no-one like you in the whole world!" The final incident in the story is also worth a glance. (Didn't they cram a lot of story into 10 pages in the 50s?) It seems that Alice's father disappeared after the road accident which originally blinded her. "I couldn't look at my little girl's sightless eyes without knowing that I was responsible because I was driving the car!" In fact the crash was caused by a mechanical fault for which he was not to blame. He's been "running away needlessly from his own conscience!" It would be over-subtle to see this as an allusion to the disciples' question to Jesus about the blind man in John's Gospel ("Rabbi, who sinned, this man or his parents, that he was born blind?") But it is very, very striking that Superman's actions have not only cured Alice of her blindness, but also cured her father – who is called John, by the way -- of his guilt. It goes without saying that for Christians, the important thing about Jesus wasn't that he cured sick people, but that he told them that their sins were forgiven. Alice's father is briefly suspected of wanting to steal the money which generous Daily Planet readers have donated to help Alice and her mother. This also represents a change in how Alice sees the world "I never realized people were so good." For anyone who grew up with Stan Lee's melodramatic over-writing, this 1950s Superman is astonishingly simplistic; even naive. There is hardly one word of what you could call dialogue in the whole story: everyone talks in pure exposition and the "Alice in Wonderland" line made me cringe with embarrassment even when I was 10. However, like many superficially naive children's stories, it actually has considerable complexity and emotional depth. We have a character whose literal darkness is the outward representation of an inner darkness – she has no father, her mother is poor,she thinks that there is nothing nice about the world -- all summed up in her disbelief in Superman. Superman heals her, restores her inner light, her family, and makes her see things she never saw before – the beauty of America, the inherent goodness of the human race. Any relationship between Superman and Jesus is one of resemblance rather than symbolism: Superman, the character, does some of the same kinds of things which Jesus did, with some of the same kinds of results. This seems to me to be more sophisticated and effective than the approach of the movies, which do little more than point up certain supposed similarities between the origin of Superman and religious saviour myths. I think that the religious language that is used in the "healing" scene makes it more than likely that Finger was aware of the overtones of his story. But maybe a half-remembered Sunday School lesson just worked its way onto the page while he was writing against a deadline. Very good piece Andrew! Very good indeed. You don't fancy doing my 10am sermon for me do you? This is great writing. One of the most elegant and insightful pieces of writing I've seen from you, and it's amongst good company, to be sure. Thank you for a wonderful (yes, using the word intentionally) piece on Silver Age Superman. I am reading a lot of these stories with my 5-year-old son right now, and it is exciting for me to see how they really do awaken his "sense of wonder." As a Christian, I appreciate your handling of the supposed Superman-Jesus analogies in a more thoughtful way than often found in the media (or as you point out, the latest movie -- my personal feeling is that the 1978 film was a little more subtle, or at least more sparing, about it). This 1955 comic book story "The Girl Who Didn't Believe in Superman" is a close reworking of the 1953 Superman television episode "Around the World with Superman". Among the differences is that the young blind girl, in the television episode named Ann Carson, is very enthralled with the wonder of the world, even though blind. The contest is there a "Letter to Superman" contest for the prize of a trip around the world, and Ann's entry wins. One sentence is quoted by Superman: "And I think the trees are as green in Arabia as they are outside my window and that people, wherever they are, are as beautiful as love." The wrinkle is that Ann has signed her mother's name, Elaine Carson, to the letter. She explains to Clark and Lois that her mother appears increasingly harrassed and bothered and cynical and unhappy and feels that a trip around the world to see all its wonders would allow her to realize how wonderful the world is, just as Ann does. The motif here is that of the physically blind person who purportedly perceives some things more clearly than many sighted persons. However Ann's physical blindness does limit her. She could not read the rules for the contest as set forth in the Daily Planet and accordingy somewhat misunderstands it, her knowledge coming from what she has heard on the radio. She initially doesn't understand what Superman has to do with this round the world trip, and her intiail reponse to Lois' insistance that Superman is real is, "Now don't start treating me as a child" and "There's no such person as Superman and you know it." Then: "Of course not, I've figured all that out. It's just publicity." When Clark meets Ann a second time, he claims to be Superman, but Ann claims he sounds like Clark. However Superman almost convinces Anne by bending placing her hands on a fireplace poker, bending it into into a U, and then bending it back. However Anne thinks a normal person who is really, really strong normal person might be able to do this. Then Superman tells Ann he will go into the next room where a normal person could not hear her and Ann is to whisper something. Ann whispers, "I want my daddy, back home again." Superman returns into the room and whispers it back to Ann, who seems convinced. Superman remarks, "I somehow think you've always believed in me, all this time, haven't you?" The scene is unusual and especially effective in that Superman has remained dressed as Clark Kent, other than removing his glasses. Elaine, Ann's mother, is planning to skip town immediately to a new unknown address for reasons unknown to Ann. A man named Murray is shadowing her, whom she knows his her husband's lawyer. Tearfully Elain explains to Lois that her husband Jim was a wonderful man, but that he was driving during the accident that blinded Ann, that she had blamed him for Ann's subsequent blindness, and was horrible to him, and so he l0eft her. It is not actually explained what Murray and Jim are after her now for, but probably we are to understand a custody battle for Ann. Lois promises the Planet's help and her personal help. Clark later suggests Elaine should talk things out with Jim without going through laywers. 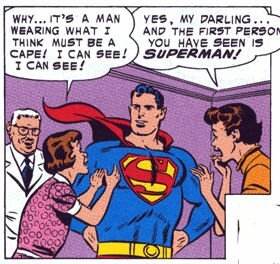 We first learn that Ann's blindness is curable when Ann tells her mother that Superman has seen a piece of glass lodged in her optic nerve that normal X-rays have missed. Elaine then agrees not to skip town, in order that Ann might have the necessary operation. Ann's eye-specialist, Dr. Anderson, is shown performing the operation guided by Superman who is using his X-Ray vision. The sence is not followed by the standard removing of bandages as in the later comic book adaptation, but by the equally common cliché of the Doctor coming into the waiting room (where Elaine and Lois are nervously waiting), and smiling and nodding. Immediately the story cuts in place and time to Perry White's office where Perry, Lois, Elaine, Superman, and the sighted Ann are being photographed by Jimmy Olsen just before the tour begins. During the trip, as they pass over Arabia, Ann remarks that it was because of Arabia that she wanted her mother to take the trip. Superman responds that he knows that her daddy was in Arabia. Ann blurts out in surprised voice: "Was?!" Upon Ann's return, Lois takes Ann into a room where her mother and father are embracing. Though it is not explicit, presumbly Clark and Lois have worked to bring Jim back and resolve the problems between him and Elaine, a resolution presumably now possible since Ann is no longer blind and because, as we have seen, Elaine has relized she was wrong so so horribly blaming Jim. Whether Finger's changes in the tale are mostly purposeful are mostly from faulty memory of the television episode are unknown to me. He has reversed the personalities of the girl and her mother and greatly increased the girl's stubborness about Superman which makes for a simpler tale with more narrow focuse (which does not nencessarily mean a worse tale). But Finger's "lovely child" contest seems somewhat crass. And the returned father appears at the end with no forshadowing. The particular possible religious imagery mentioned by Rilstone seems to be almost all due to Finger, though in the television episode Superman does say to Ann, "You are going to have to believe in my if I'm going to help you." My own guess is the television episode is inspired by various television stories and film stories about believing in Santa Claus in which lovers or parents get back together and everyone, including a cynical kid, learns that believing in Santa Claus (at least in some form) is purportedly better than disbelief. Thanks for this, Jallan. I hadn't realised that the TV Superman had this kind of reciprocal influence on the comic book version. I must admit I've really only started to take an interest in the silver age Superman since the DC "Showcase Presents" reprints came out... I can see that Supermanology is a lot more complicated than I realised!